Don’t use Export-CliXml, use ConvertTo-Html instead! 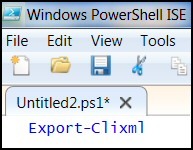 Question: OK; what is the point of Export-CliXml? Answer: To store objects until you need them again; in which case, you call for the sister cmdlet: Import-CliXml. In this example I employ Invoke-Item solely to check that the xml file has been created as expected. Scenario: Let us suppose we are troubleshooting services that are running after we have made a configuration change. Note 1: Observe the classic Export –> Import combination. Note 2: Userful parameters include -NoClobber, which means don’t over-ride the file. This parameter is useful if you want the output file to be read-only.